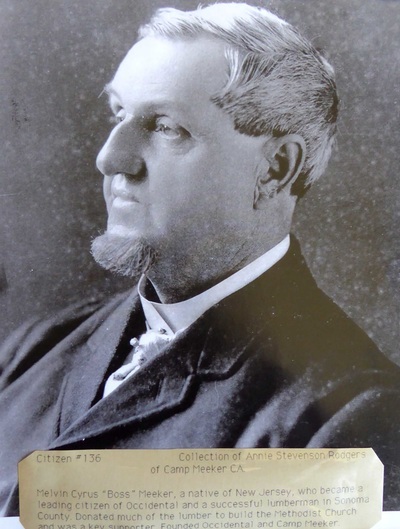 Melvin Cyrus "Boss" Meeker, the founder of Occidental and builder of the church. The inside of OCC in the 1890s. 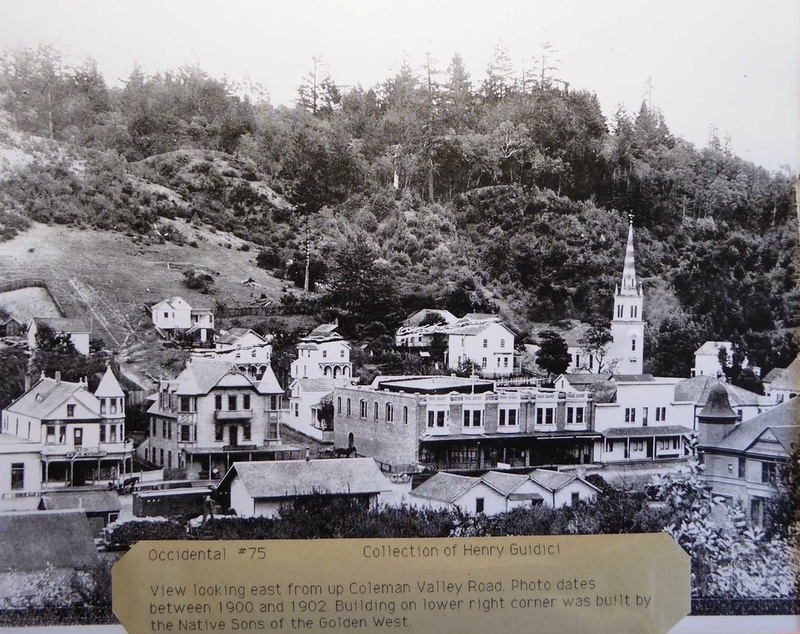 The Occidental Community Church is the oldest building in Occidental. It was built in 1876. The spire and bell tower were added in 1888. After the 1906 earthquake, the tower was declared unsafe and removed, being replaced by a dome. The present tower and spire were built in 1976. 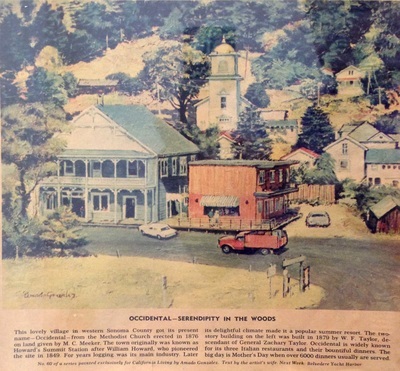 The village of Occidental had a unique beginning. Many nearby communities began with a saloon or a railroad station. M.C. 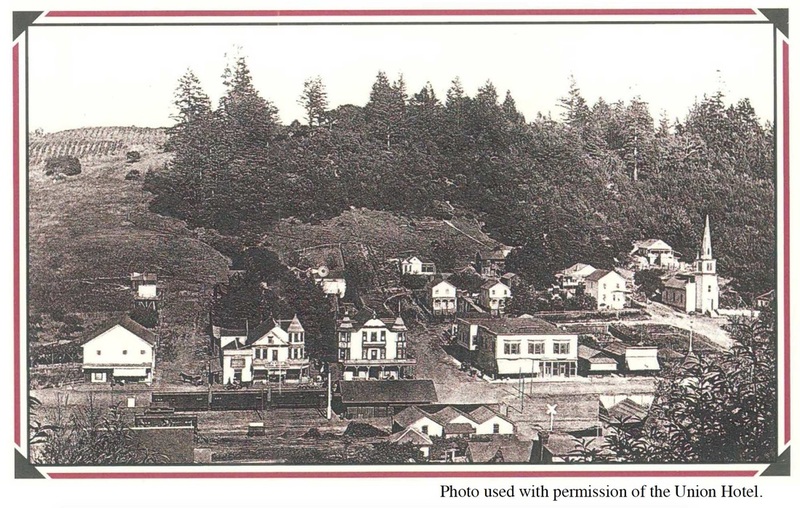 “Boss” Meeker was a logging engineer who had a vision for a town on the summit where the railroad would soon pass. 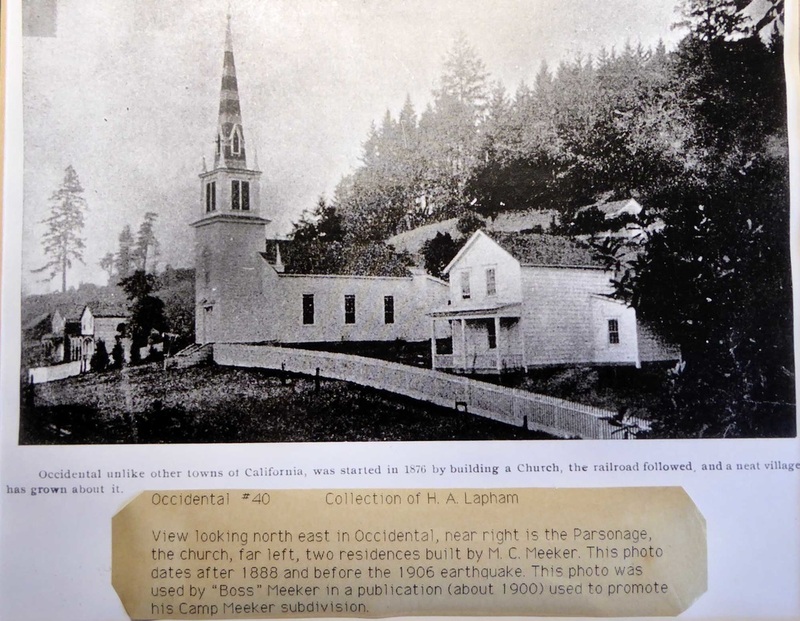 Instead of seeking to attract people to Occidental by starting a general store, post office, railroad station, or any of a number of other buildings, Meeker chose to establish the town by constructing a church. Meeker donated the land on which the church sits and milled the redwood lumber. Although people lived in the surrounding hills, the community of Occidental began with the completion of the church. The church began as a Methodist Episcopal Church, but during the 1960’s, it began to decline until it closed it’s doors in 1972. For two years it remained vacant, with the homeless coming and going, finding protection from the weather. Trudy, an antique store owner in Freestone wanted to preserve the church building as a community hall. She entered into negotiations with the Methodist district to purchase the building and place her antique store in the back rooms. But God had other plans in mind for the historic country church. A group of local people still desired to have a Protestant church in Occidental. Through the assistance of the American Missionary Fellowship, the dozen or so new members were able to purchase the church for $4,000.00 which was much less than Trudy would have given. 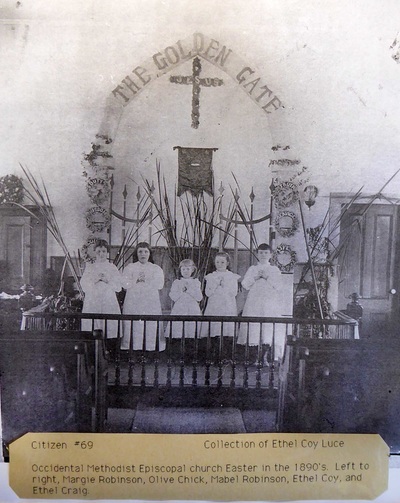 The dozen members began holding church services. In 1974 they held a Vacation Bible School. Rev. Jerry Hackett, then director of Mt. Gilead Bible Camps, preached on Sundays. The tiny church began to grow. In 1975 Rev. Linden Heath and his wife Janet had taken a sabbatical and lived in Occidental. Rev. Heath was asked to come and preach occasionally. The church board finally called him to be the pastor, paying him $35 per week. According to the minutes of the August, 1976 Board meeting, this was much more than the $20 the church usually paid a visiting pastor. The stipulation from Rev. Heath was that he would do the preaching, and the Board would do the administration. The new church called their first pastor. Pastor Peter Munson and wife Tracy came to Occidental in 1990 as the assistant to then-Pastor Linden Heath. 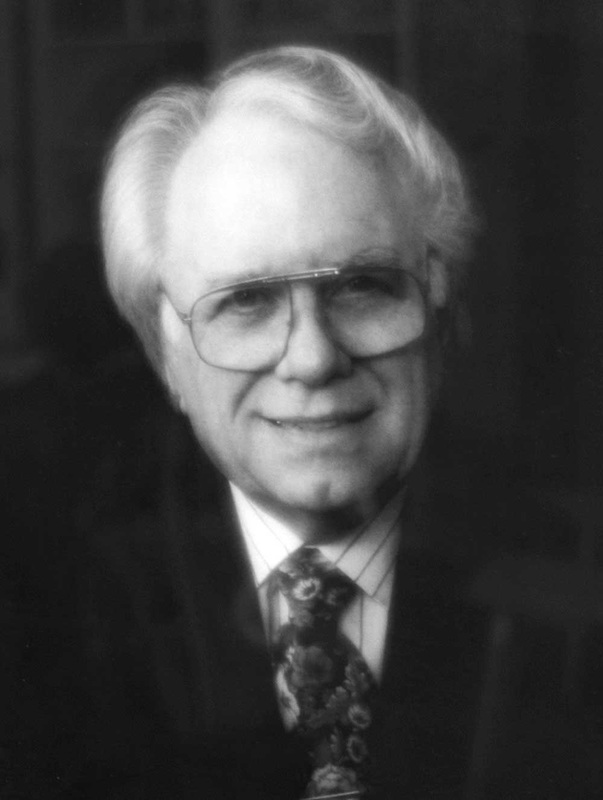 In 1993 Pastor Heath announced his retirement and in January 1994 the church called Peter to be the Pastor. Peter faithfully shepherded this flock until 2015. Pastor Rick Hahn, and wife Sue, were called to be pastor in 2016, after serving for many years as pastor at Sebastopol Christian Church. 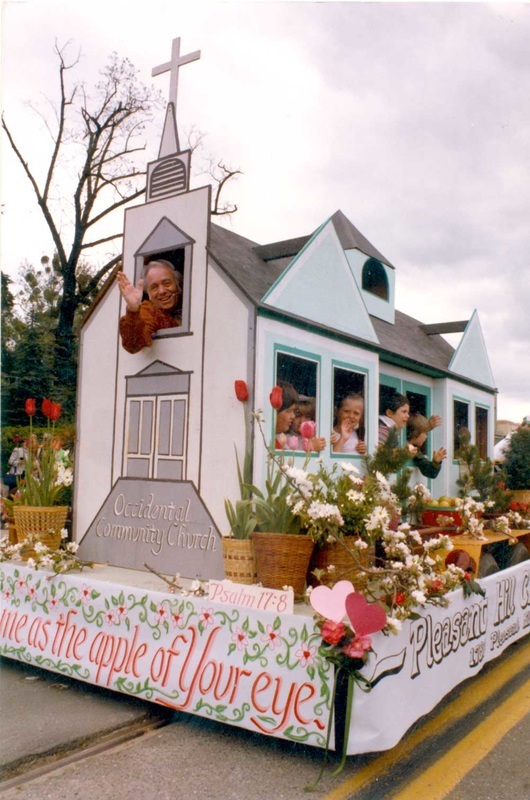 Linden Heath and the OCC/PHCS float in the 1983 Sebastopol Apple Blossom Parade.